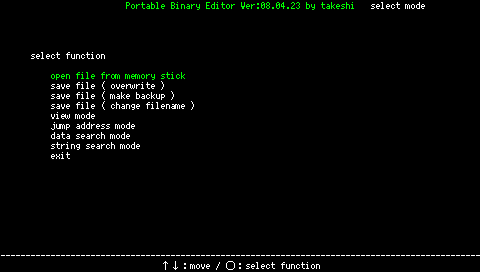 Fixed a few bugs and added support for resolving imports when the utility functions are called, should now have much more compatibility than the static loader provided with the PSP Filer Go version on the last page. If you downloaded before this edit was made, download the same link above, fixed a bug with the net functions. An example of it working with Skullgrog (doesn't work with the normal signing method), fun game. Yet another bug fixed, same link above. I´m such a noob that i didn´t note those ~10 homebrew i had wich gave me static elf error while decrypting. qwikrazor87 i had no luck by try brew which i was thinking it can work. .. they "just" faild on relocation fix. TurboGrafx16.zip http://www.mediafire.com/?4c277u7pd9zmj00 by IllegalMachine not signed! guys does anyone have this hex editor or where can i get it? I´m pretty sure you do not find at site butcher suggest (again and again -- please stop spam) !!! Beta scena is ok but login need also a lot death links etc. For my arent many dead links - all files are most 99% in atached on site do if site is not down that file is. And taht program is on site 5s search and is . But that about daing sites and mirrors in PSP scena is bad - becouse no much more new sites obout PSP . But thanks like my backuping from years most of example PSP on DVD USB etc some day reuploding files . Do you still have Team Fortress v1.3 stashed in their somewhere? Its been days since I've scoured the net for that elusive file.